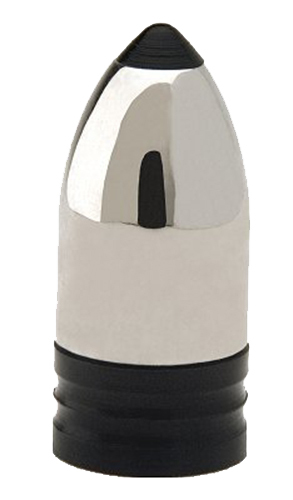 The PowerBelt Platinum AeroTip Bullets utilize a state of the art plating technology, a more aggressive bullet shape and a fluted gas check design that combine to make the Platinum Series the best performing PowerBlets ever. PowerBelt Platinums are plated using a proprietary process that produces a harder exterior surface than standard copper plating. This harder plating results in reduced resistance as the bullet travels down the bore, producing faster, more consistent velocities to improve both trajectory and accuracy. PowerBelt Platinums also deliver an improved ballistic coefficient by utilizing a more aggressive bullet taper design. Not only does the taper provide for a more aerodynamic flight, it also helps control the rate of expansion - regardless of powder charge or distance the bullet travels. PowerBelt Platinums feature a fluted gas check, allowing the check to be sized larger than that of a standard PowerBelt, while still being just as easy to load. The larger diameter gas check produces higher and more consistent pressures - further improving both velocity and accuracy.